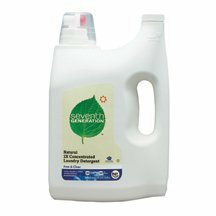 Seventh Generation Free and Clear Natural 2X Concentrated Laundry Liquid, 150 Ounce -- 4 per case. View More In Liquid Detergent. Mrs Meyers Clean Day 2X Geranium Laundry Detergent, 64 Ounce -- 6 per case. Tide HE Laundry Detergent, Original Scent, Liquid, 100 oz Bottle - four 100 oz bottles per case.